JoAnn Ryan listens to a scene from Mission: Impossible – Ghost Protocol with her son Ryan Albers, 24, at his home in Highland Park. Albers was in a skiing accident seven years ago and suffered a traumatic brain injury leaving him with a significant cognitive disability. 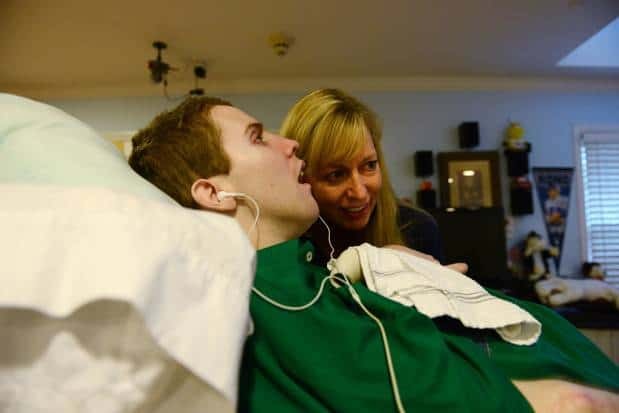 In response to Ryan’s needs, JoAnn Ryan, along with other Park Cities families, created Connecting Point of Park Cities, a day program for adults with special needs who have aged out of local school district programs. After three years of planning and acquiring a space, the group has began their campaign to raise $300,000 in hopes to open the program later this fall. The journey to create Connecting Point has brought together many in the Park Cities — from those with children with special needs to those with a connection to the special needs community, such as Kami Burns, Highland Park ISD director for special programs. In her personal time, Burns serves as a secretary on the group’s board. She believes the group will be an expansion on transitional opportunities for people with disabilities as well as a local place for others in the community to volunteer. “I’m excited about all the opportunities this is going to bring to all the adults with disabilities locally. Now families will not have to travel outside of the community to have access to these types of programs,” Burns said. With a growing wait list for My Possibilities and a large North Texas special needs community still underserved, Thomas said he doesn’t foresee Connecting Point having much of an impact on the nonprofit’s enrollment. “There could be 10 new programs that open up tomorrow that are all the same level of quality and it wouldn’t affect everybody from a functioning standpoint,” he said. If fundraising efforts prove successful, Connecting Point hopes it can hire a special education teacher, nurse and aides, and then start its programming thereafter, Oliai said. The group views opening the doors at Connecting Point as a major milestone, but Himes said when that happens, its work will be far from over. “I see it as an ongoing process because I think when we open our doors we are just going to continue to grow — that’s not the end of it, it’s just the beginning,” Himes said.